How do you change your luck? 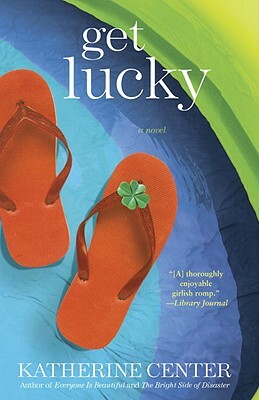 Katherine Center’s marvelously entertaining and poignant new novel is about choosing to look for happiness—and maybe getting lucky enough to find it. Sarah Harper isn’t sure if the stupid decisions she sometimes makes are good choices in disguise—or if they’re really just stupid. But either way, after forwarding an inappropriate email to her entire company, she suddenly finds herself out of a job. So she goes home to Houston—and her sister, Mackie—for Thanksgiving. But before Sarah can share her troubles with her sister, she learns that Mackie has some woes of her own: After years of trying, Mackie’s given up on having a baby—and plans to sell on eBay the entire nursery she’s set up. Which gives Sarah a brilliant idea—an idea that could fix everyone’s problems. An idea that gives Sarah the chance to take care of her big sister for once—instead of the other way around. But nothing worthwhile is ever easy. After a decade away, Sarah is forced to confront one ghost from her past after another: the father she’s lost touch with, the memories of her mother, the sweet guy she dumped horribly in high school. Soon everything that matters is on the line—and Sarah can only hope that by changing her life she has changed her luck, too.